A design for this table has been on the drawing board for quite some time. Well, a day before the site was set up for a special Scout Campcraft program, it was decided to build one as a functional showpiece. The Table WIth Flags a-Blowin’. We sank four 6′ spars two feet into the ground for the main corners, and sank eight 4′ spars a foot into the ground for the rest of the upright supports. Between the corners we lashed two 10′ lateral spars, and for the two long benches and the sides of the table top, we used six-footers. The table top itself was comprised of 4′ platform spars, and the side seats, 3′ ladder rungs. Since the 10′ lateral spars were really too long, we compensated for the unexpected space between the 6′ bench spars and the ends of the ten-footers by dispensing with the back rests, and instead lashed on a flag at each corner. What a piece of work! It stayed up for three weeks and repeatedly got plenty of heavy use on a daily basis. The Floor Lashings regularly needed adjusting, and served as a perfect location to pass on the Double Floor Lashing technique to program participants who applied it later to building rafts. The 4′ vertical uprights soon worked themselves to a slight wiggling state, but continued to furnish their necessary support. Also, during the three week period, due to the heavy adults who loved to seat themselves at this rather elaborate piece of camp furniture, occasionally various Square Lashings had to be tightened up as well. 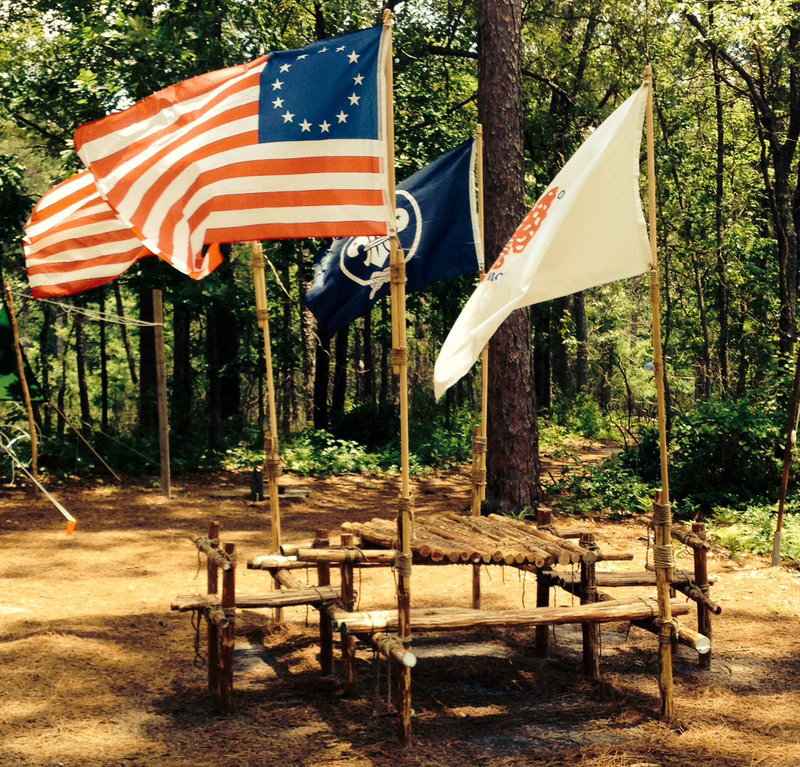 Nevertheless, with all the strain, rain, and wear, this version of the large camp table happily stayed intact.